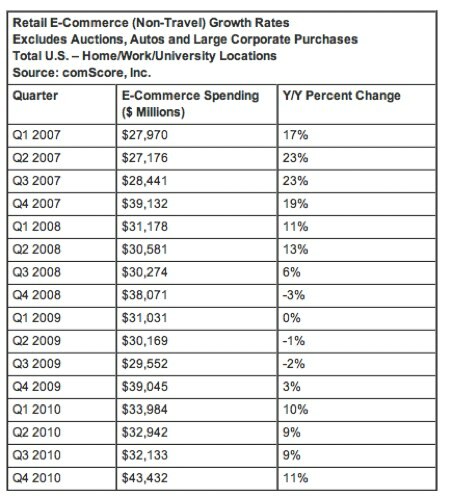 Online spending in the fourth quarter of 2010 reached record levels, according to comScore’s latest data on retail e-commerce. After a stronger than expected holiday shopping season, online retail spending in Q4 reached a record $43.4 billion, which is up 11 percent from the same quarter in 2009. Additionally, 84 percent of U.S. Internet users conducted an online transaction in Q4 2010, which is up from 78 percent last year. comScore reports that the growth rate for the quarter represented the fifth consecutive quarter of positive year-over-year growth and second quarter of double-digit growth rates in the past year, thanks to an improved economy. Of course, Q4 spending was largely buoyed by holiday shopping and this year there were a number of factors besides an uptick in the economy that helped push spending to record levels. Free shipping offers, and the Northeast Blizzard following the Christmas holiday also propelled shoppers to look online for deals in the quarter. For the quarter, the highest grossing prodict categories were Computer Software, Consumer Electronics, Books & Magazines (which exclude digital downloads), Computers/Peripherals/PDAs, and Toys and Hobbies. Each of the categories grew at least 15 percent in Q4 2010 vs. a year ago. And comScore says that the top 25 online retailers, including retail giants Amazon and Walmart accounted for 68.4 percent of dollars spent online, which is up 5.6 percentage points from a year ago. Interestingly, in Q3 2010, the top 25 retailers accounted for slightly more, with a share of 69.9 percent of dollars. This could show that shoppers also bought items from smaller retailers online this holiday season. It’s hard to imagine that 2011 could break 2010’s records in terms of e-commerce sales, but it should be interesting come holiday shopping season to see if U.S. consumers continue to spend freely.